ERTL Big Farm, just like the real thing, only smaller! Made-to-scale miniatures to collect or play with. 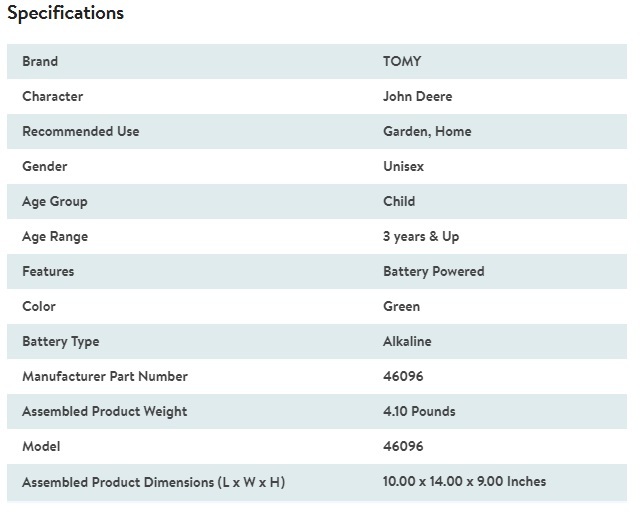 A very extensive toy product range, based on the farm perspective. You will be amazed to see all the things Big Farm Toys has to offer. 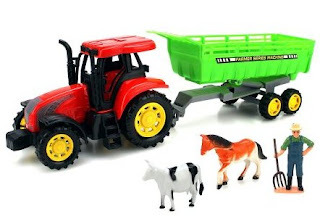 ERTL's These high quality plastic farm toys have all the details you would expect to find from die-cast replicas, but are more affordable yet durable enough for kids to enjoy hours in the house or at the playground! Here are some of the most surprising top-selling Ertl Big Farm Toys in every state, according to retail giant like Amazon and Walmart. Farm toys are timeless gifts for kids. Not only do farm toys encourage children to use their imaginations back to a simpler time and create their own stories, they can help to develop creativity in a fun and stimulating manner. Opening and closing doors increases dexterity and many of the farm toys on this list have interactive additions like lights, songs, and sounds and teach cause and effect as well as language skills, colors, maker skills, and more. Few children have the opportunity to grow up on a farm, but there are plenty of high-quality farm toys to give your child a taste of farm life. Endlessly fascinated by barns, farmers and animal figures, farm machinery including excavators, tractors, dum truck, combine harvester, and many more. Children will love playing with these fun, interactive, and educational farm toys.Truly, kids are naturally drawn to toy farms, toy tractors, toy farm animals and various other farm related toys. We have aimed to make it easy for the readers to make happy kids by purchasing farm toy collection. We also give the list of Ertl Big Farm toy prices and hints or tips in product description to make the customers get more detail which of these farm toys will your child love most. The retail giant found that popular and best-selling farm toy product categories included John Deere to Case IH, with specific farm toys ranging from utilitarian to unique. Mots people usually start by purchasing a miniature version of their first farm tractor. Then they may add their first combine or some other special piece of equipment. Big Farm 1:16 sized John Deere Tractor is the only off-road toys designed with loads of detail and feature lights and sounds play action.It offers with opening hood, removable front weights and three point hitch. Rear cab window opens to give access to the interior's steering wheel. Cab removes to provide access to battery door. This tractor is compatible with other 1:16 implements. The price is $20.98. Straight truck features chrome plated wheels, front bumber, front grille, air cleaners, exhaust stack and visor. There is a rear hitch on the truck to hook up other 1/64 implements. 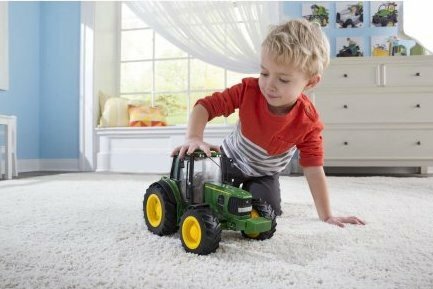 The die cast John Deere 7R tractor features a cab, wide front axle and single wheels. Haul the tactor on the truck flatbed trailer. Produced by ERTL, the leader in farm toys for over 65 years. The price is $12.54. The freewheeling Cat Big Builder Dump Truck has rumbling action that captures the authentic feel of a machine in motion. Lift the dump bed to trigger realistic sounds. Push button for lights, sound effects and music to add to the fun. 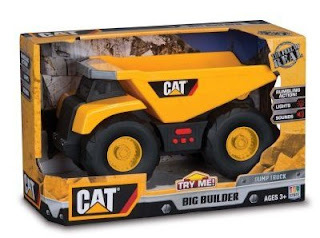 The 9" Cat dump truck toy makes a great gift come holiday time. Your children's eyes will light up when they see this fun toy ready to go. 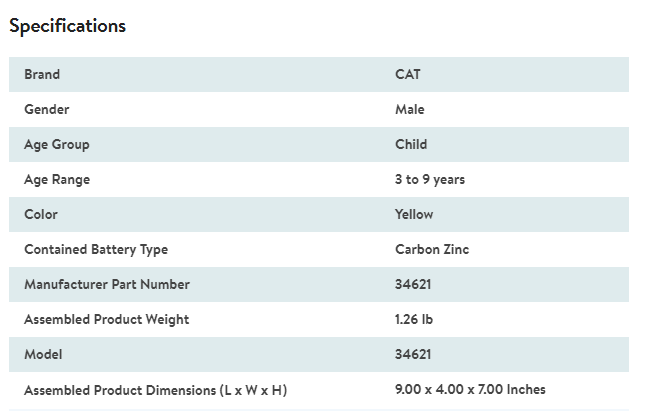 The kids' dump truck comes in a bright, vibrant yellow color just like the real thing. Use it outdoors to play in the dirt or snow or keep it indoors to carry on the fun year-round. The price is $11.23. The Big Farm 1:16 Case IH 8240 Combine has all of the realness of one that customer has on the farm, yet fashioned for child’s play. This combine features lights and sounds and a auger that rotates when the combine is pushed along with steerable rear wheels and removable front wheels. 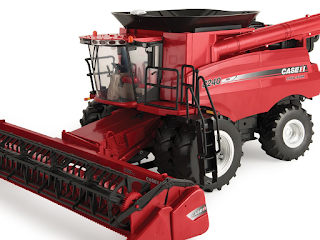 Great for indoor or outdoor play, this combine also features removable front wheels and the ability to unload popcorn seeds from the grain tank through the auger! Little ranch hands can feel as if they’re harvesting their own crop. It’s a great compliment for a farm set.The price is $92.99. Take the fun from the farm to the park or the beach with the John Deere Big Farm Excavator Toy. Digging in the sandbox is fun and easy with its pivoting dipper stick and bucket. Children will learn more about the characteristics of different types of materials such as which are easy to maneuver and push around from sand to dirt to water. 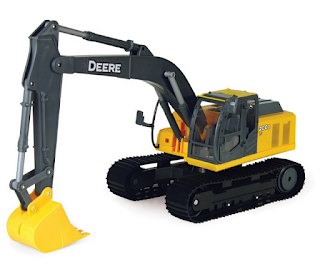 Featuring a premium die-cast excavator body made 1/16 to scale, it looks almost like the real thing. It has a working boom arm that raises and lowers, a cab door that opens and closes, and a body that rotates. The soft PVC tracks roll easily over a variety of surfaces. This John Deere excavator even has lights and sounds for added enjoyment. It requires three AAA batteries to run (included). This outdoor play for kids is just as equally important to exercise their minds along with their bodies. The price is $63.99. Just like the real thing, only smaller; this 1:16 Big Farm excavator features lights, sounds, and a fully positionable boom arm with bucket. Dimensions: 23.87"L x 8"W x 7.7"H.
Kids love to play with tractors, farmer and animal figures is the best! The Farm World Tractor Trailer Children's Friction Powered Toy Truck Playset comes with many pieces including different vehicles. Animals, farmers, fencing, and cargo for the vehicles complete this fun and colorful playset. And The price is $16.95. Age range: Recommended for ages 3+ and up Perfect for use on its own or with other playsets SIZE Dimensions: Approx. 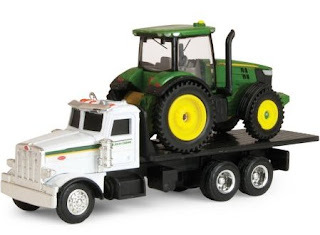 overall length (Tractor + Trailer): 14 inches The Farm World Tractor Trailer Children's Friction Powered Toy Truck Playset w/ Farmer & Animal Figures. This harvesting set gives little cultivators a real look at what a day in the life of a harvester is like. The Peterbilt 367 has functioning components much like the real deal with a grain box that lifts and opening rear gate as well as rear grain door. The tarp on top can be removed to give little hands access inside. 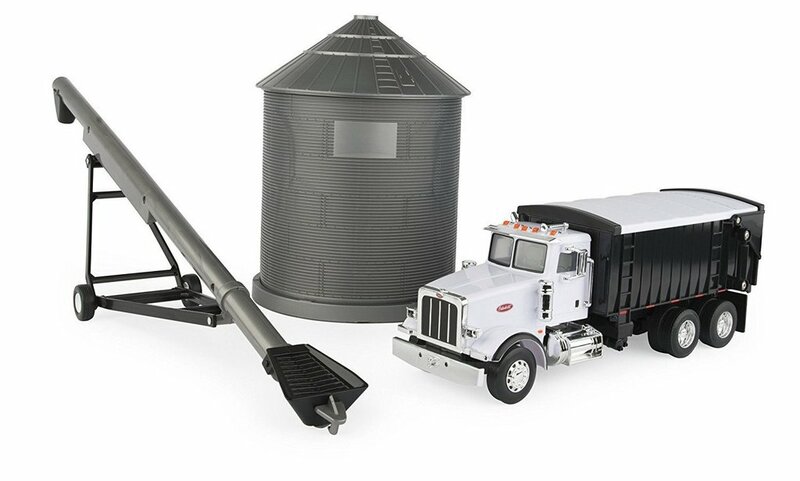 The grain bin and the auger add the perfect touch to complete the set. Whether they are growing up on a farm and want a harvesting set of their own or simply enjoy everything about the agricultural life, this set is a great start. This set works very well with the TOMY 1:32 John Deere S680 Combine sold separately. Exceptional detail for a collector and great play value. Age grade 3+ years. The price is $37.99. The Big Farm toys are designed to replicate their real counterparts in a smaller scale that is built for kids; however, there is nothing small about this John Deere combine! Weighing close to 10 pounds, it really measures up to live up to the name Big Farm. The Big Farm 1:16 John Deere S670 Combine features lights and sounds and a rotating auger. It features a rotating grain head that moves as the combine moves when pushed forward or in reverse. It has a spinning auger that rotates outward and unloads grain pellets. The steerable rear wheels make it easy to move off-road.This combine also features removable front wheels and the ability to unload popcorn seeds from the grain tank through the auger! Batteries included. 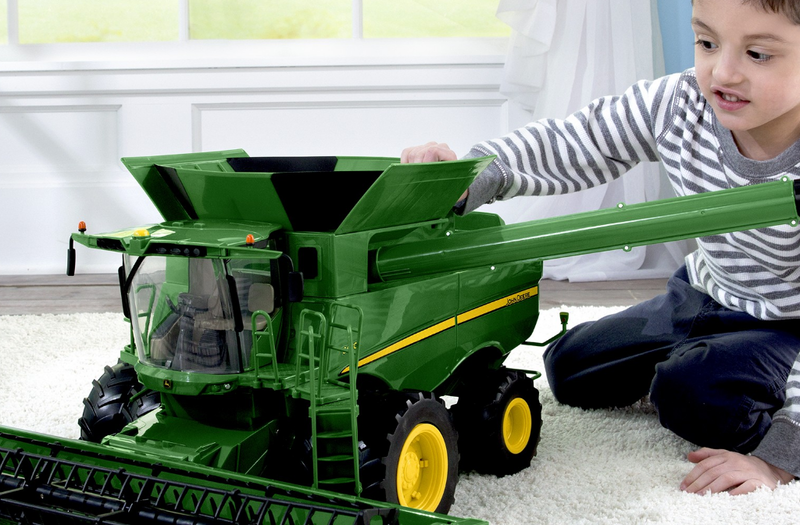 Kids will love operating this John Deere combine indoor or outdoor play. The price is $92.99. Dimensions: 27"L x 14.1"W x 11.94"H.
Working unloading auger, includes “grain” pellets which can be unloaded from the combine into a wagon. Every holiday season, there’s one must-have toy for kids. There are many toys that come and go during a kid’s various stages of life. Ertl Big farm toys, however, are a timeless favorite. Customers have been known to wait in line for hours, pay massive amounts of money and even physically fight in toy-store aisles during holiday discount sales just to get their hands on the year’s hottest farm toy. Fortunately, these are all well-made toys that encourage children to play and imagine. 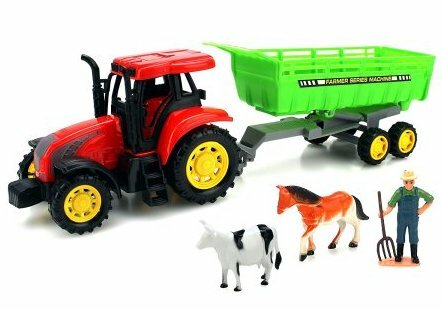 Complete your farm set with toys from ERTL Big Farm! We have a huge variety of kids farm toys, offering scale tractors, combines, harvesting sets, excavators, implements, figurines, dump trucks and many more! Create a full farm from our selection of children farm toy models from ERTL Big Farm. Even adults can appreciate the many collections of farm toys out there that may bring out their inner child or reminisce on fond memories. These are toys that can be enjoyed and loved from one generation to the next, inspiring young minds to accomplish big things. 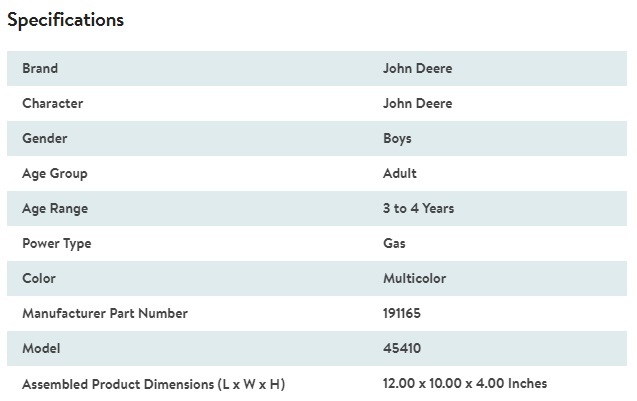 0 Response to "8 Best-Selling Products from Ertl Big Farm Toys"